Photograph with round numbers pasted on to indicate points of interest. Label on back says: #237 - Phila. Panorama. April 9th, 1924. March 23, 1926. Seeing Philadelphia from highest point on Delaware Bridge. 1- Old Christ Church. 2- Home of Curtis Publishing Company. 3- Ben Franklin Hotel. 4- Location of Betsy Ross House [the house itself is not visible]. 5- Bellevue-Stratford Hotel. 6- The John Wanamaker Store. 7- City Hall. 8- Buildings to be razed. 9- Bridge construction work. 10- Frankford Elevated. 11- Bell Telephone Co. building. 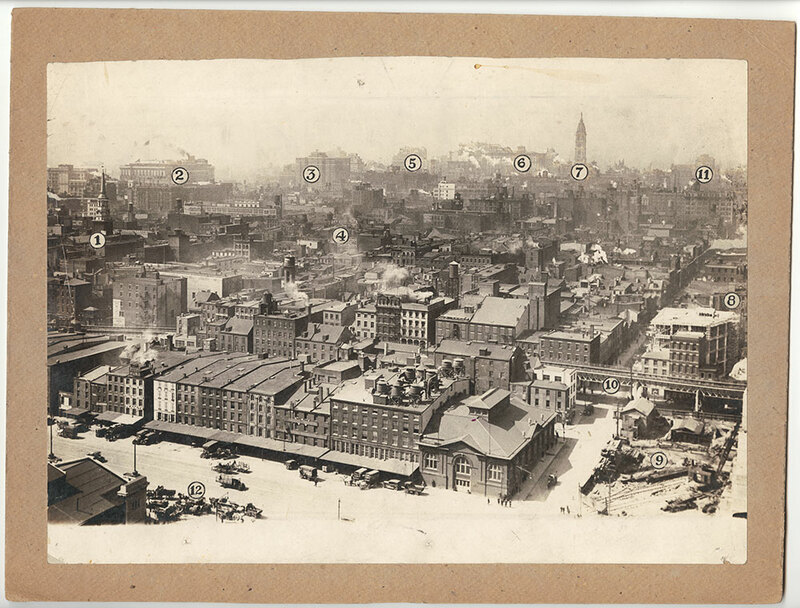 12- Delaware Ave.
Ironically, the right-most building in the foreground, the High Pressure Fire Service Building, is not labelled in this detailed panorama—and yet, it is the only one in this stretch of buildings along Delaware Avenue (today, Columbus Boulevard) that is still standing! It was built in 1903, for the purpose of pumping water to fire hydrants, from the Delaware River to Broad Street. It was the earliest system of its kind in the world. Newer firefighting innovations ultimately rendered this pumping station obsolete, and it was decommissioned in 2005. It was renovated and repurposed in 2013, and has been the home of FringeArts since then.